Clinical Investigations at a Glance provides an up-to-date, evidence-based overview of diagnostic investigations, looking at their choice, importance and interpretation for commonly presenting symptoms and conditions. 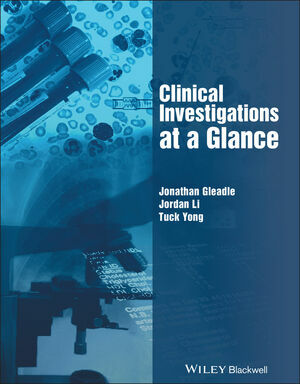 Designed to help develop the evidence-based use of investigations and interpret results properly, the book provides a unique perspective on many critical issues in medical testing, with the aim of improving diagnostic accuracy and reducing unnecessary tests or harm. Clinical Investigations at a Glance is structured in three parts: an overview of tests; common presentations (such as chest pain, nausea and vomiting, weight loss and anaemia,); and conditions organized by body system, such as cardiovascular disease, respiratory disease and nephrology.